We design quick and easy installation micro-toppings , to create unique, comfortable and resistant surfaces in all environments. We are flexible concrete. We are high performance. We are resistant. we are colorful. We are emotions. We are Deccofloor. We are experts in testing, diagnosis and surface preparation. Bodybuilders for patching, reparing and surface leveling. Micro-toppings, perfectly balanced formulas to create long lasting surfaces. High Performance Sealers for Deccofloor micro-toppings. With an elegant texture, suitable for all kind of need in the modern architecture world. 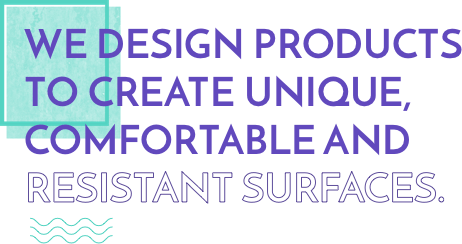 We design products to create unique, comfortable and resistant surfaces in all environments. Our well renowned low thickness products enhance your floors and walls, bringing extreme flexibility and endurance. Resistant to climate stress, Deccofloor is quick and easy installation and requires minimum periodic maintenance.